I learned yet another valuable lesson recently. Most of the time change is good, but some things are better left alone. July Fourth is a big deal in my family. Like most of you probably do, we have certain traditions. I have been taking part in said traditions since six months before I was born, (Yes, I said six. I got tired of being curled up in a belly all day, so I jumped the gun a little) and I look forward to them every year. If you could see me, you’d probably guess right off the bat that one of our traditions involves eating, and you’d be right. Every year, our family and friends gather at Nana and Paw-paw’s pool house and enjoy an Independence Day meal. Then we hit the pool just long enough to require a whole bottle of Aloe Vera to put out the fire on our skin before the annual Freedom Fest fireworks show at Fort Rucker starts. You can set your watch to my family perched on a hillside in the backyard, looking up at the sky and unleashing a veritable chorus of “Ooohh”s and “Aaahh”s every time there’s a big, smiley-faced firecracker. This happens every year, without fail. Once we even had bleachers. For the first time in my twenty-three years, somebody at Fort Rucker decided to throw America’s birthday party a day early, and Freedom Fest was held on the third of July instead of the Fourth. For the life of me I still can’t figure out why they did that, but I should have known it wouldn’t lead to anything good. Friday rolled around, and, like proud Americans filled with unbridled patriotism, we all pretended it was the Fourth while we ate hamburgers, hot dogs, chicken and sausage and tried to forget it was only the third. I was so upset at Fort Rucker for moving the Fourth to the third, I elected not to swim and sat inside the pool house with the women, who were busily cleaning out the refrigerator. Normally, any time the refrigerator is open and stuff is being taken from it, I am a happy man. When the barbecue sauce is sharing a shelf with a batch of penicillin, some mold that resembles a small Chia Pet and mayonnaise with hair longer than Lily Munster’s, even I draw the line. 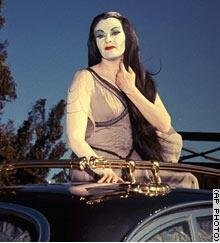 I did see a jar of chocolate chips sitting on the table, and it cheered me up a little — until I tasted the chips and realized they came out of the same refrigerator and were, in fact, older than Lily Munster. I bolted out the door faster than a scalded jackrabbit, spat out the tainted chocolate chips and sat by the pool and listened to Daddy try to read a hilarious e-mail about a guy who got his wife a pocket-taser for their anniversary until it was announced we would say the blessing and eat. After I had my fill, I went back out by the pool. It wasn’t long before I grew tired of watching everyone else have fun and decided to go home and get my bathing suit. This seemingly insignificant task turned out to be more than I bargained for because someone cleaned the house and moved my bathing suit from it’s ordained spot on the floor of the bathroom. When I finally finished ransacking the house in search of a suitable replacement for my bathing suit, thirty minutes had passed and Mama’s laundry room looked like the Tasmanian Devil had taken up residence in it. I shut the door and hoped she wouldn’t notice until I had successfully acquired a passport and left the country, then put on my swimming shoes and returned to my grandparents’ house. I swam for all of ten minutes before everyone went to grab a seat on the hill, despite the fact the fireworks could have been easily viewed from the deep end of the pool. I sat my chair up on the left end of the front row and prepared to watch the show, which — per usual manner — started ten minutes late. I was just beginning to “Oooohh” and “Aaahhh” on key when half the fire ants in Southeast Alabama decided to crawl into a hole in my swimming shoe and make a meal out of my left big toe. Now, I know God has a reason, purpose and plan for everything, but I sure wish He’d clue me in on what He was thinking when He made fire ants. I hate fire ants, and I’m pretty sure they’d be an effective form of torture if we ever come across Bin-Laden. I danced a jig trying to get those ants out of my shoe. I even hit them with my cane once or twice, but all I did was hurt myself while they gnawed my big toe until they eventually exploded, at which time the remaining half of the fire-ant population entered my shoe. The second wave finished off my toe and half my foot before I finally cleared them out in time for the grand finale. I enjoyed the fireworks as much as one can when he’s got ants in his shoes, but I didn’t get to enjoy the finale. The finale was supposed to be a barrage of fireworks so colorfully amazing they would be almost impossible to top next year. We all heard the booms, but nobody saw what happened until we picked up the paper the next morning. Apparently the fireworks, which were supposed to ascend halfway to Heaven before bursting forth in all their colorful-finale glory, went sideways into a parking lot across the street. Amazingly, only seven people were hurt, and only three of them needed a band-aid. For my sake — and for the sake of those poor, unfortunate souls who may choose to watch from the celebration from the parking lot — I hope the folks at Fort Rucker move America’s birthday party back to America’s birthday. If not, I hope they get a shoe full of fire ants.